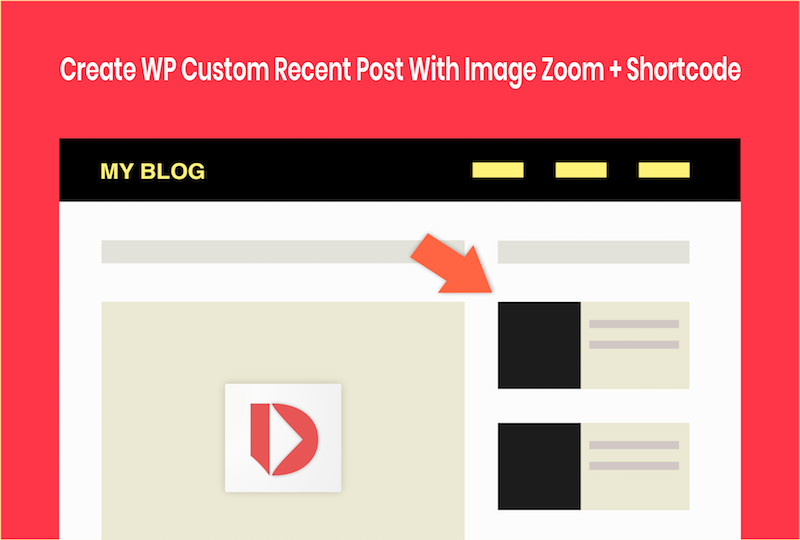 Want to say goodbye to spam on your WordPress Site? Here’s how to deal with it. 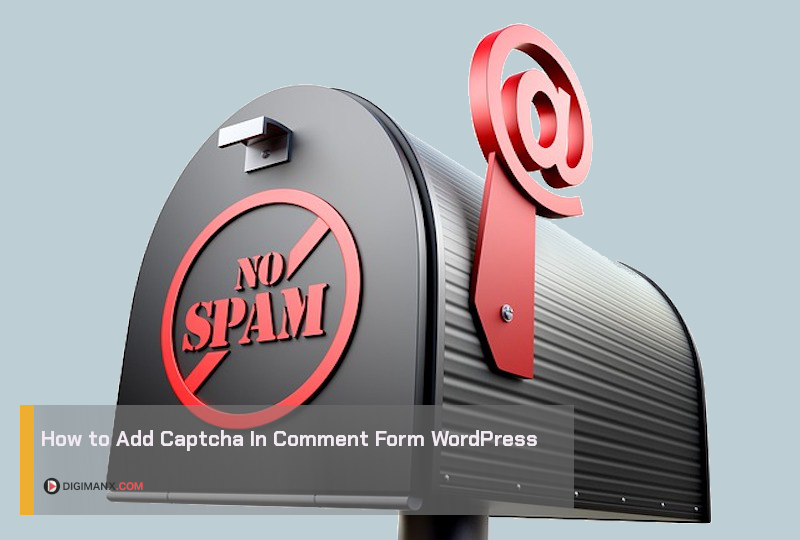 In this post Digimanx will show you how to add Captcha in the comment form of WordPress to fight spambot. Since the beginning of the internet, all webmaster will be dealing with the spambot. This bot, randomly crawling the web to sending spam comment on any website. Even if we already using anti-spam installed on our site, they (spammer) always found a new way to pass it. We all hate spam, even spammer may hate spam too. But yeah! this is a part of internet kind of things and nothing we can do except to fight them. And if you have tired for seeing spam comment on your WordPress comment moderation lists. This is how to get rid of these annoying spammer. One of WordPress plugin that works great for this task called Advanced noCaptcha & invisible Captcha. This plugin will help you to put Google reCAPTCHA on site comment form. 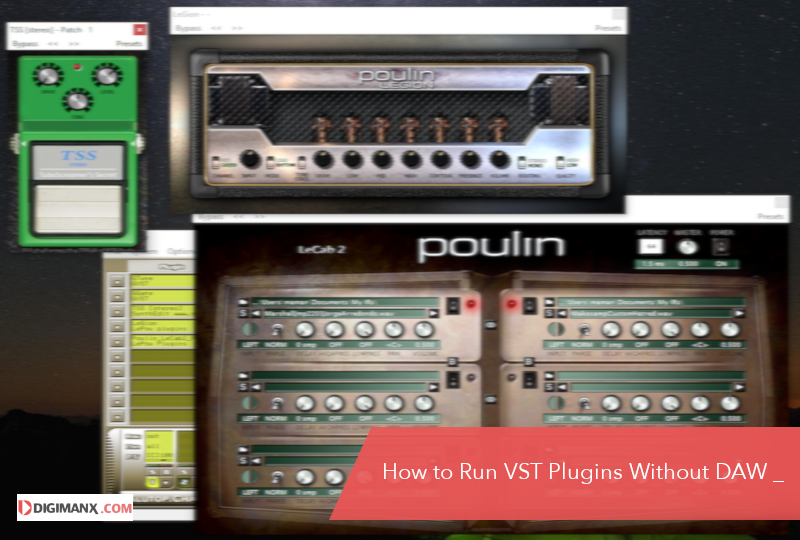 To install the plugin, go to your WP Admin > Plugins > Add New. And search for Captcha and you’ll see Advanced noCaptcha & invisible Captcha on the list. Just install the plug and activate it. To make Captcha plugin works, you need to sign up on Google reCaptcha. If you already have, then good all you need to do is just placing your site key and your secret key. [Note!] this plugin only work with reCaptcha v2. 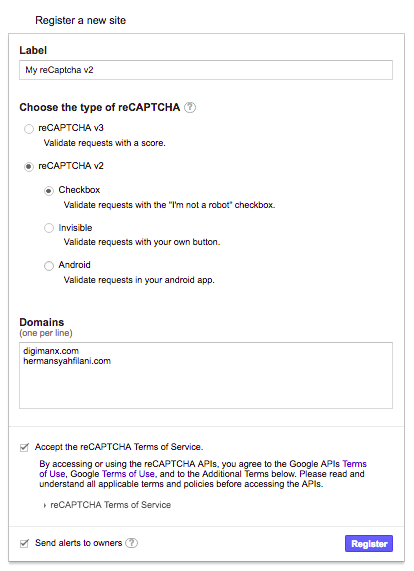 If you guys don’t set–up Google reCAPTCHA for your WordPress site yet. Here’s how to do it. First go to Google reCAPTCHA site page, and sign up using your Google account. Next, in your admin page fill the reCaptcha forms to create new reCaptcha API for your sites. In the ‘Label’ form, name it as you like. For example, you can name it My reCaptcha v2. Make sure in the type of reCaptcha option you choose reCaptcha v2. Then, in the domains form add all your site you have one per line. Don’t forget to check accept Terms of services box and hit the ‘Register’ button. 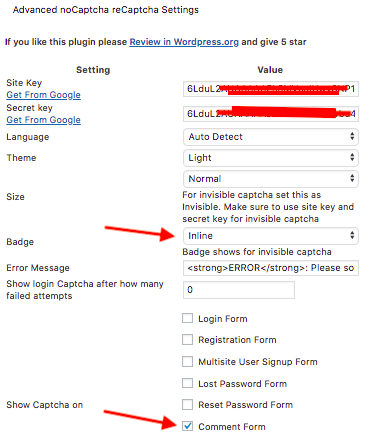 After you register new reCaptcha, now copy your site key and secret key into WordPress Captcha plugin settings page. Make sure choose to place reCaptcha on Inline in the Badge setting and check ‘Comment form’ on ‘Show reCaptcha on’ setting. See the example of the screenshot below. Click to enlarge image. You can let the other setting by default, then save the settings and done!. Now check one of your post to see that there is now you have a Google reCaptcha badge at the end of your site comment form right just before the Submit button. Congratulation! 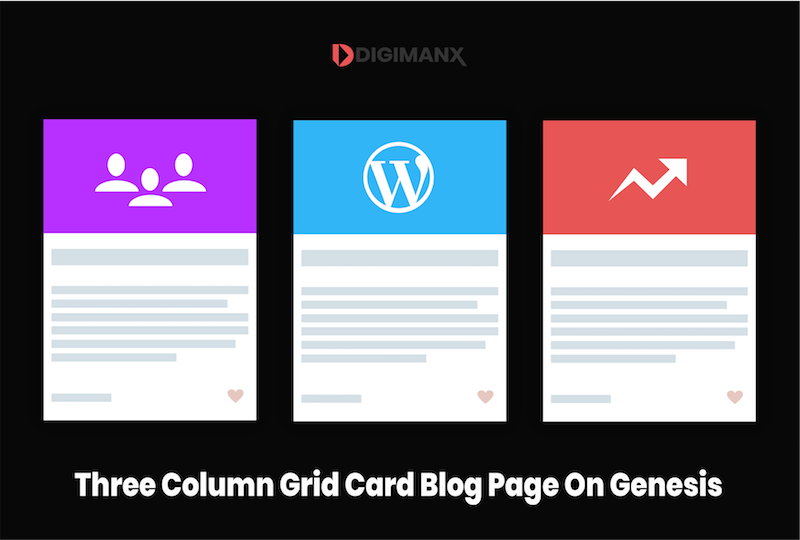 now you can say goodbye to spam comment and just focus on creating great content. You know, that sometimes we came with the great idea that we want to share but when we open the WordPress Admin dashboard we suddenly get distracted by spam queue. Bah! that isn’t cool at all. So! let’s fight spam and spammer.